Large or long items can sometimes be hard to carry, but not so much because of their weight, but because of their size, shape, or even their packaging. The Strap-A-Handle is a product that was born to correct these awkward-carry items by giving them a handle. After all, everything that is easy to carry has a built in handle. Unfortunately for us, many of the items we have to carry on a daily basis do not have handles, things like boxes, bags of pet food, packs of water, or even bulk TP. The Strap-A-Handle is as simple as it sounds; a strap that goes around the item you want to carry, with a built in handle. It comes is two different versions, a light duty (up to 50lbs) with plastic clips, and a heavy duty (up to 75lbs) with metal h-ring and a perpendicular handle. Both versions are priced under $15. 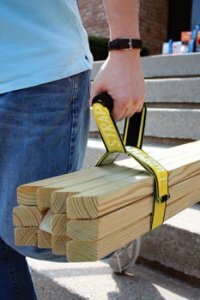 We can't let the wife have all of the fun; by teaming up with a second person and a second Strap-A-Handle, you can easily carry multiples of long items, such as a bundle of 2x4's or PVC pipe, making it a suitable tool for the jobsite. I can see myself using this to carry bundles of baseboard, or other moldings.